One thing is for sure - National Bookstore is spoiling all PH-based book lovers. It's only April, and yet there have already been four major bookish events (Gayle Forman's signing; Kate Evangelista's Til Death book launch; Becca Fitzpatrick's signing; and now, Tahereh Mafi, Ransom Riggs, and Veronica Rossi's signing)! How crazy is that!? Hey, I bet none of us are complaining, though! As a matter of fact, around 2000 people attended the signing in Manila, and around the same number attended the one in Cebu! I had the chance to be part of a bloggers forum with the authors, and I am so incredibly grateful to National Bookstore for the opportunity. We were a bit pressed for time this time around, but everyone still had so much fun! Tahereh and Ransom, despite obviously still being very jetlagged, were very accommodating. If I didn't already love them from their first visit, I would have fallen head over heels in love with them last Saturday! (Also, oh gosh, can we please talk about Tahereh's outfit? A perfect 10, all throughout! Her make up too!) 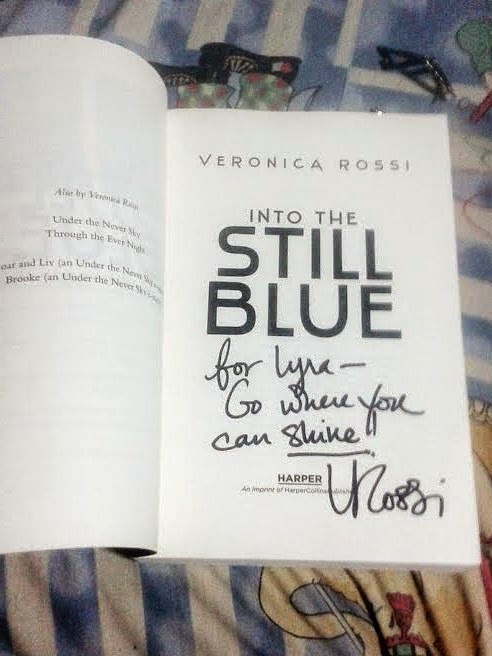 Moreover, Veronica is one of the most amazing, down-to-earth authors I have ever met, bar none. She is just so friendly! And Ransereh. Ransereh. RANSEREH. They were all sorts of adorable. I think everyone died from all the cuteness! While writing Shatter Me, Tahereh already knew who Juliette was going to end up with. Guys, this broke my already fragile heart. I adore Adam from the bottom of my heart, and I consider him one of my favorite YA heroes. But you know what? I guess I kind of have more closure now after hearing Tahereh say this. Veronica Rossi is co-authoring a New Adult book under the pseudonym "Noelle August". I am so excited for this! I love New Adult, and I have always loved Veronica's writing - her words just flow, and she has a knack for excellent world-building. I can't wait to see Veronica explore the nitty-gritty world of New Adult! If Ransom had to choose a picture to represent his books, he would choose a picture of the inside of his heart. Creepy, huh? Tahereh intentionally portrayed a weak Juliette in Shatter Me. She wanted her readers to see how Juliette grew into a strong woman as the series progressed. This is such a tough concept to pull off, but Tahereh was able to do it with flying colors. Juliette from Shatter Me - weak and scared - is so different from the latter books' Juliette - strong, poised, and beyond all, confident. I say with no doubt whatsoever that readers truly were witnesses to Juliette finding herself. What a journey it was! Veronica's message to her readers through her trilogy - you can find happiness, and that you should think about what home is to you. Such sound advice, and I suppose I'm not alone in saying that this couldn't have come at a more apt time. This truly made me ponder - what is home to me? For other fun facts (and for the complete Q&A), please refer to my fellow bloggers' recap posts. They transcribed everything! The links are on the bottom of this post. And now... the signing proper, plus tons of photos! 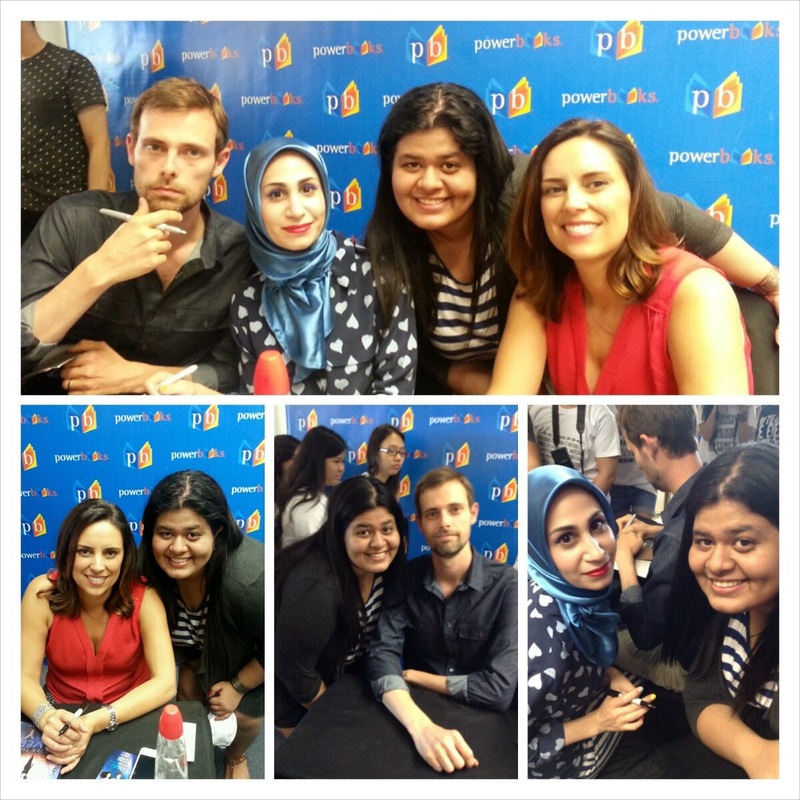 With Tahereh Mafi, Ransom Riggs, and Veronica Rossi! Veronica: I like your name! Tahereh: It's so good to see you again! Me: I like your make up! And that, ladies and gentlemen, is what happens when you talk to people you admire when you've only had two hours of sleep. So much for being eloquent. But hey. At least I was able to make them laugh! 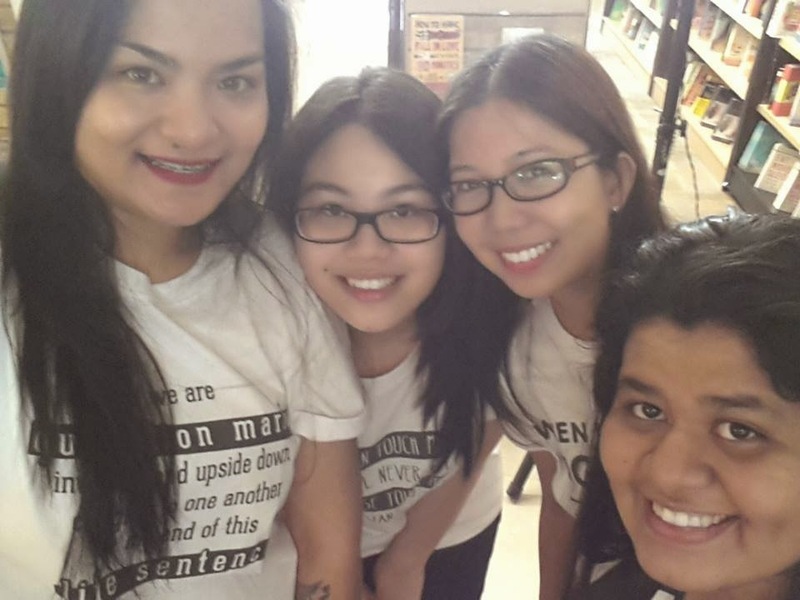 Selfie 3.0 with Kate of The Bookaholic Blurbs, Louisse of The Soul Sisters, and Jesselle of The Lifelong Bookworm. I think we're getting the hang of this! Here's a gratuitous picture of me! 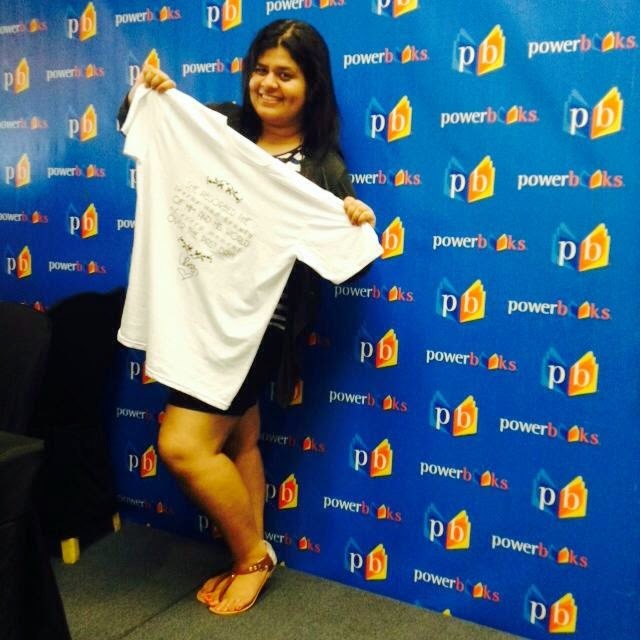 I didn't have the chance to change into this beautiful shirt (designed by the talented Hazel of Stay Bookish) especially created for this signing, so I opted for this kind of picture instead! 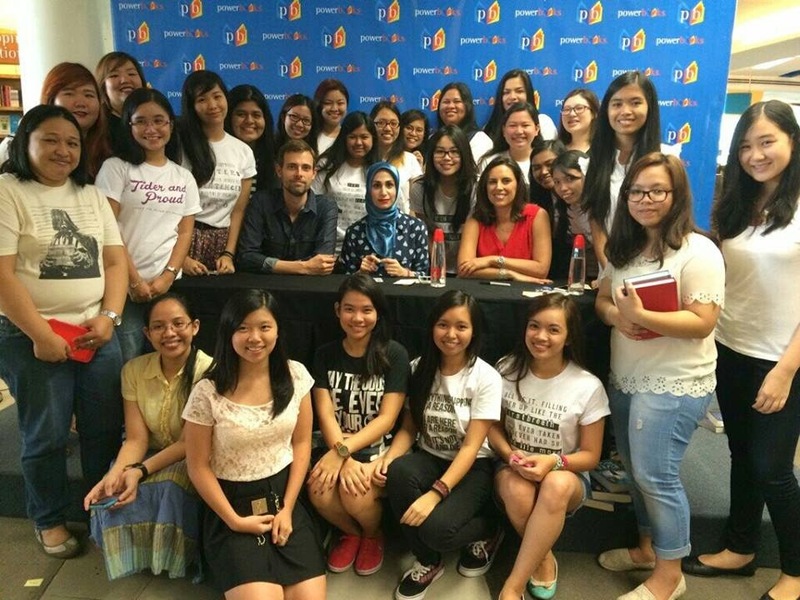 Here's a group shot of all the bloggers with Ransom, Tahereh, and Veronica! Here's a photo I snapped of the crowd at the book signing proper. Crazy, isn't it? Reminds me of crowds during sports functions! All in all, I had an excellent time. As always, thank you so much to the entire National Bookstore team for bringing these three authors to the country, and for organizing both the Bloggers' Forum and the book signing proper. You guys are incredible! Also, getting to spend time with my fellow book bloggers is a great way to end the week - can you guys believe that we've all known each other for more than a year now? I love you all! Always remember, everyone, per Veronica Rossi, go where you can shine. LYRA! Reading your post made me feel warm and fuzzy. From the Q&A factoids to the last photo. :3 Lovely seeing you at the event! 2) You're right...NBS is definitely spoiling all PH bookworms! See you in June, yeah?